If you are looking to purchase a rainwater tank, then you have probably heard about other tank accessories you might need. One important accessory that helps to keep your rainwater clean is called a Rainwater First Flush Diverter, but what is it? 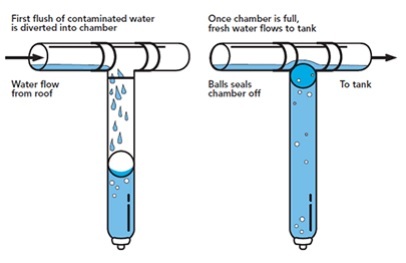 A Rainwater First Flush Diverter functions by preventing the first few litres of rainwater from entering your water tank. Consider that those initial litres of rainwater running down your roof (the “first flush”) can contain up dust, debris, insects and leaves. The rainwater diverter greatly helps to reduce these undesirables from flowing into your rainwater storage tank. How do Rainwater Diverters Work? When it rains, the water runs down your roof, into your gutters and normally down a PVC down pipe. From there, the rainwater would flow into the top of your water tank as it flows through a strainer. If you have lots of leaves and debris in your area, then your tank inlet strainer will quickly fill with gunk needing to be emptied often. No matter how great your tank strainer is, somehow debris and the like always finds a way into your tank. This all settles at the bottom of your tank, and if you don’t have a self-cleaning tank system installed, it eventually turns into sludge. To help keep the rainwater harvested in your tank more safe and fresh, you can also install Rainwater Diverters. Rainwater diversion systems normally consist of vertical PVC piping several metres in length. These are installed generally along the piping that leads into the top of your tank. This results in the rainwater flowing into your gutter and down your piping to eventually fall into your vertically installed PVC piping. The rainwater starts filling up this pipe. Inside the pipe is a special ball valve that rises as the pipe fills with water. Once full, the ball value creates a seal at the top preventing the dirty “first flush” of rainwater from escaping. The rainwater subsequently flows over the ball down into your rainwater tank as normal. Obviously, the rainwater captured in your water diversion system needs to be let out. Otherwise in future downpours it will not be able to fill up again. Located at the bottom of your vertical PVC piping is normally a slow-release valve. You can even fit a drip irrigation system that leads to your garden or your pool to avoid wasting rainwater. National Poly Industries have kits that include everything that you need to install a first flush diverter to your water tank. For more information, contact our friendly staff today.